Fresh from the Farnborough air show, Embraer embarked on an African tour to showcase their planes in what they see as an under-served air market on the African continent. 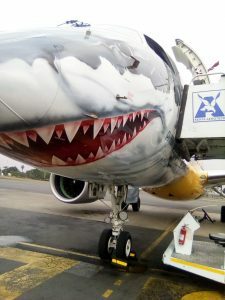 The company flew an Embraer E190 E2 jet with a unique shark-nose look (nick-named “profit-hunter”) to Algiers (home of Air Algerie) and Casablanca (Royal Air Maroc), then on to Accra and Nairobi. 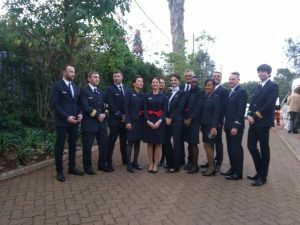 Kenya Airways (KQ), which is the largest Embraer E-jet operator in Africa and also hosts one of the few approved E190 services centres in Africa, staged an event that featured local aviation officials, KQ customers and the Brazilian Ambassador to Kenya that ended with demonstration flight that over Mt. 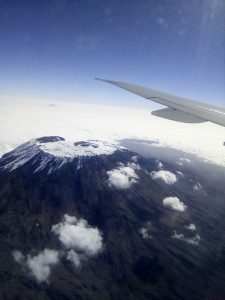 Kilimanjaro, Africa’s highest point. Embraer were keen to showcase the quiet-ness and efficiency of the E190 which they bill as the best single-aisle aircraft. 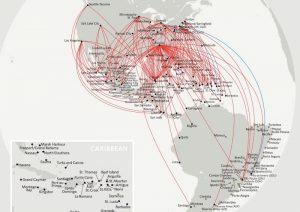 They view Africa as an under-served aviation market in which 95% of flights have less than 150 passengers and 61% of routes have less than one flight per day, with many potential new routes being 4-5 hour flights, that are beyond the operational reach of propeller planes and with their E-jets as just the right size for African airlines. 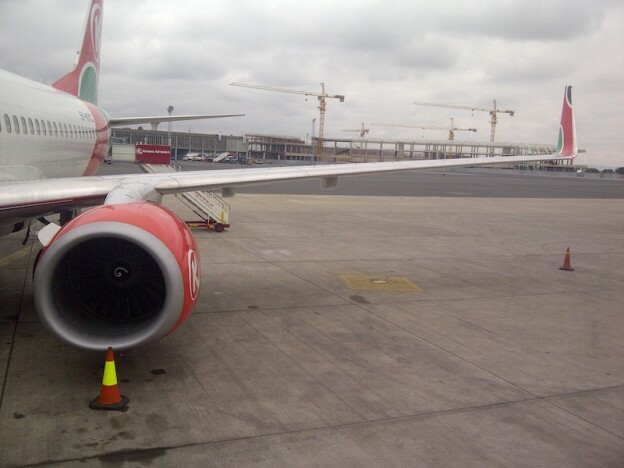 Kenya Airways has been flying Embraer’s since 2006. They stared with the smaller E170 and upgraded to the E190’s which now form a third of their lean fleet; they have 15 of them – 10 are owned, 5 on lease – and they seat 12 passengers in business class and 84 in economy. But it is unlikely that Kenya Airways that is emerging from a long restructuring process will be buying any more planes soon, but other things are happening and at Farnborough, Embraer and KQ announced a new spare parts supply deal. After Nairobi, the E2 jet flew on to Mauritius where Air Mauritius is tipped to be a potential customer and they planned to continue on to South Africa where Embraer has a training centre and a regional office for Middle-East and Africa. This entry was posted in Embraer, Kenya Airways on July 29, 2018 by bankelele. 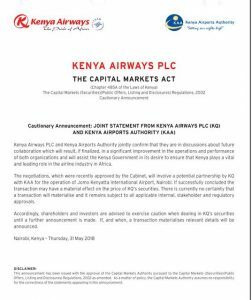 This week, Kenya Airways and the Kenya Airports Authority – (KAA) published a joint notice about discussions towards collaboration in the management of Nairobi’s Jomo Kenyatta International Airport (JKIA). This is not new or unique. Last year the Ethiopia government merged it’s airline, the largest airline in Africa, making it the centerpiece of a hub-strategy for Addis that incorporates the airport, passengers, logistics, training, catering and tourism). In Rwanda there is also a similar management arrangement, another soon at Tanzania, while the latest results from Emirates, in its 30th year of profit announced last month, show 14% of their revenue was from cargo and 15% was from D-nata which does ground handling and logistics for other airlines around the world including from extensive investments in Europe, Asia, and North America. At a previous shareholders meeting (AGM), KQ Chairman Michael Joseph spoke of closer ties with the government, and the need for the airline to get in involved in route approval, and protecting Nairobi as its hub. He said that whenever a foreign leader visited or the President of Kenya went overseas, a “win” from such trips was the granting of more rights to foreign airlines to fly into Kenya, which was to the detriment to KQ, in which the government had a significant investment. According to its latest results (June 2016 from the Auditor General of Kenya), KAA which constructs, operates and maintains aerodromes around Kenya (including 16 airports) had Kshs 13.5 billion revenue and a Kshs 2.6 billion profit (in the previous year, this was Kshs 4.4 billion). The revenue includes Kshs 6.7 B (billion) in passenger service charges, Kshs 1.7B from concessions and Kshs 3 B from landing and parking fees – half of which are probably paid for by Kenya Airways. JKIA handled 100,000 aircraft takeoffs/landings and processed 6.7 million passengers (out of the 9.6 million KAA handled in total) and 235 million tons of cargo. 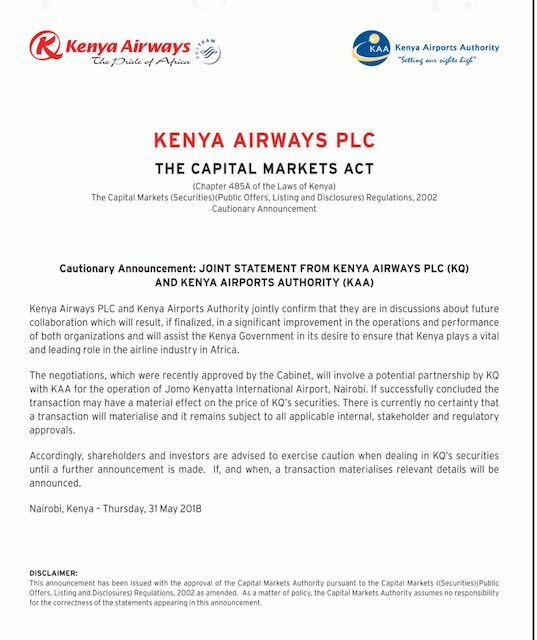 But KAA also comes with it a lot of politics such as tussles over the composition of its board and top management and project disputes such as the Greenfield terminal at JKIA, and with private developers such as World Duty Free at JKIA and other land disputes at various airports around the country. The newspaper report (Business Daily) also mentions that the proposed partnership with will also see Kenya Airways exempted from payments of some Value Added Tax (VAT) and the Railway Development Levy, a 1.5% tax on all imports into Kenya that is meant to finance ongoing development of the Standard Gauge Railway (SGR). This entry was posted in Kenya Airways, Kenya domestic tourist, Kenya taxation and tagged JKIA on June 3, 2018 by bankelele. New, and ongoing, opportunities to apply for. Earth Journalism Network: Climate Change Media Partnership 2018 Reporting Fellowships Apply to report from both the Global Climate Action Summit in San Francisco and the UN Climate Negotiations in Katowice, Poland. The Africa Food Prize is the preeminent award for recognizing the extraordinary individual or institution whose contributions to African agriculture are forging a new era of sustainable food security and economic opportunity for all Africans. The deadline for nominations for the USD 100,000 prize is Tuesday 15 May and the 2018 winner will be unveiled at a high-profile gala dinner at the African Green Revolution Forum (AGRF) 2018 this September in Kigali, Rwanda. African Food Security Prize Launched to Stop Devastating Crop Pest: Feed the Future, supported by Land O’Lakes International Development and the Foundation for Food and Agriculture Research, has opened its call for applications for the Fall Armyworm Tech Prize that offers to fund up to $400,000 in digital solutions that aim to help stop the spread of fall armyworm in Africa-a pest that is devastating agriculture and demolishing billions of dollars’ worth of crops across the continent. The application deadline is 14 May 2018 and applications may involve a range of digital solutions and must demonstrate how the proposed tool(s) will help smallholder farmers and those that reach them, such as extension agents, monitor, identify, treat or report the incidence of fall armyworm. Africa Innovation Summit II: A call for application has been launched across Africa for innovations addressing the continent’s challenges – which include energy access, water, food insecurity, health systems, and governance. Applications close on 15 April. The 2018 African Union Research Grant offers up to $9 million of funding. The deadline for applications is May 22 The call supports research on food, nutrition security and sustainable agriculture (FNSSA). Andela Kenya, Uganda, Nigeria Fellowships: The recruitment Schedule for Andela Kenya fellowship cycle 29, and Andela Nigeria, cycle 33 deadline is May, while for the Andela Uganda fellowship cycle 9 and boot camp, the deadline is April 27. Anzisha Prize: Aims to find a young entrepreneur who is making a difference in their community, aged 15- 22 so that they can have the chance to win a shared amount of US$100 000 and become an Anzisha fellow. The deadline is 15 April. Asoko, in a new collaboration with the London Stock Exchange Group, PwC and CDC Group is seeking Africa’s leading private companies – companies to Inspire Africa for a leading report showcasing Africa’s 1,000 most dynamic private, high-growth companies. Deadline is June 11. BAKE Awards 2018: The nominees of the Bloggers Association of Kenya (BAKE) Awards 2018, that recognizes and awards the best in Kenyan blogging have been announced in categories including Technology, Photography, Creative Writing, Best Business Blog, Food , Environmental , Fashion & Style, Agricultural, Best New Blog, Corporate Blog, Sports, Entertainment, Education, Travel, Public Health, County Blog, Religious or Spirituality , Lifestyle, Beauty & Hair, Best Video Blog (Vlog), Social Issues & Active Citizenship, and Kenyan Blog of the Year. Voting for the winners is now on, up to 30 April. The BMCE Bank of Africa – African Entrepreneurship Award 2018 has $1 million of prizes and a trip to Morocco for entries in categories of innovation or sports entrepreneurship. Deadline is April 30, and more details here. Are you looking for mentoring to launch or grow your business or idea in Africa? Submit a brief summary to start your journey! new technologies and their impact on international security (with a focus on artificial intelligence or space), the geo-economics of technology, climate-resilient development ( managing energy transition in a low-income context) and the rising burden of non-communicable diseases (NCD’s) in Africa. The deadline for applications is 29 April. DEMO Africa 2018: DEMO Africa is a launch pad for emerging technology and trends, attracting over 2000 people from around the globe to experience the finest African innovations. The top five startups from DEMO Africa will be sponsored to Silicon Valley for an all-expense paid trip to be part of the Lions@frica Innovation Tour. Now accepting startup applications until June 15. EDiT Research Fellows in Applied Development Finance: The Global Development Network (GDN) and the European Investment Bank (EIB) have partnered to create the ambitious EIB-GDN Program in Applied Development Finance for deepening understanding of EIB’s investment operations in African, Caribbean and Pacific (ACP) countries. Under this partnership, GDN and EIB will identify, train and deploy teams of research professionals in the ACP regions to conduct “deep dive” studies of selected projects funded under EIB’s Impact Financing Envelope (IFE). Fourth Mining 4i: The Strathmore Extractives Industry Centre (SEIC), in collaboration with the Kipya (Africa) Limited and Extractives Baraza, hosts the Fourth Mining 4i, an annual invite-only forum which focuses on the promotion of Kenya’s mineral potential by attracting investment in technological innovation. Google Africa Scholarship Program: Web and Android Scholarships available for residents of African countries. Some scholarship recipients may be able to participate in an Andela Learning Community with our partners from Andela. Finally, top students from each track will earn full scholarships to one of our Android or Web Development Nanodegree programs. Applications due by April 24. Kalasha Kenya: Submit your entries for the #MyKenyaMyStory competition for a chance to walk away with grand prizes worth Kshs 500,000 Check poster for more details. The Competition Authority of Kenya #CAKuzaAwards2018 is celebrating excellence in Kenyan Broadcasting. Vote for your favorite TV and Radio Station, by sending the word KUZA to 15601. Voting is free. Merck Accelerator Nairobi Satellite Program: In partnership with Mettā, Nairobi, Merck Accelerator’s satellite program in Nairobi is seeking early-stage startups with no more than 4 years in existence, startups in the fields of Healthcare, Life Sciences, Performance Materials and other search fields such as Biosensing and Interfaces, and Precision Farming. For startups based in East Africa, Nairobi Applications are open to May 5, 2018, and founders that are available are to attend a boot camp on May 15-18 in Nairobi, Kenya, if selected. MEST Africa Challenge 2018: MEST is celebrating 10 years of supporting aspiring African entrepreneurs with a first Pan-African pitch competition, the MEST Africa Challenge. MEST Africa Challenge 2018 will give winning applicants the chance to meet and pitch to leading investors, corporate and ecosystem partners from Africa and beyond, at the finals in Cape Town. The trip will be fully funded. The winning entrepreneurs could receive, as much as, sh.5,000,000 ($50,000) in equity investment and space in one of MEST’s incubators. Companies that apply must be primarily tech-focused. Details here and the deadline for applications is April 22. Microsoft Imagine Cup 2018: Microsoft has announced this year’s Imagine Cup, the students’ developer technology and innovation competition that will see winners walk with $100, 000 in prizes. Imagine Cup participants create or join a team of up to 3 students. Together, they make an original technology project from start to finish: come up with a great idea, make a plan, build a project, and submit. This year’s Imagine Cup has three special awards that represent the current state of digital transformation: Artificial Intelligence, Big Data, and Mixed Reality. Norwegian Accelerator, Pangea, a platform connecting African startups with international investment & expertise, has shortlisted 11 start-ups who will be considered for funding of up to 50,000 USD per startup. The 11 start-ups companies are drawn from Kenya-9, Egypt -1 and Nigeria-1. Pangea plans to launch a crowd investment platform in June 2018, allowing accelerated startups further access to funding. The 8th Orange Social Venture Prize for Innovative Startups in Africa and Middle East (50,000 Euros in Prizes) aims to reward the best innovative business projects. Application deadline is May 31, but now no more Kenyan firms are eligible after Orange divested from Kenya. Pitch AgriHack 2018 for young agriculture entrepreneurs is a competition for agriculture startups owned by young entrepreneurs, with reward being capacity building and access to a grant. It is organized by the Technical Centre for Agricultural and Rural Cooperation (CTA) and the African Development Bank (AfDB). 8 winners will be selected from 2 categories and there will be an additional category to reward a woman-owned, founded or co-founded startup by one of the partnering organizations that made Pitch AgriHack 2018 possible. It is open to e-agriculture startups offering digital services in the agriculture sector. Details here and the deadline is 21 May. She Leads Africa Accelerator is set to provide training and funding for women-led technology enabled businesses. The 2018 Accelerator will consist of three 1-week residencies in Lagos where entrepreneurs will receive training from the SLA team, business leaders and experts. Applications close on May 20. Upstream Oil & Gas Awards: The Upstream Awards 2018 is a ceremony to recognize and celebrate outstanding achievements from within the emerging upstream oil and gas industry. Nominations have closed for, among others, nominees for company of the year, drilling contractor, oil field services ​company of the year, upstream CEO, upstream woman of the year award, local community award, local supplier, oil & gas future leader, upstream financier of the year, journalist of the year, legislator of the year, engineering award, life achievement award, and upstream county award. USAID and Feed the Future have issued an invite to Sub-Saharan Africa women in agribusiness for the Accelerating Women Entrepreneurs Prize 2018. It is open to women helping smallholder farmers increase access to agricultural input (seeds, fertilizer, etc. ), technology (ICT, irrigation, etc. ), financial and risk management services. Winning applicants will enjoy access to capital to scale and improve their work. Details here and the deadline for applications is 25 April. Visa will open the first Visa Everywhere Initiative for Sub Saharan Africa to young developers at this year’s Nairobi Tech Week (NTW) taking place from April 19- 21. Developers who win the Visa-led hackathon during the tech week will automatically gain entry into the Visa Everywhere Initiative where they will have an opportunity to compete for a chance to win up to US $50,000, at a regional event in the region. WTO 2018 Essay Award for Young Economists: The WTO has issued a call for young economists to submit papers for the 2018 WTO Essay Award. The award aims to promote high-quality research on trade policy and international trade co-operation and to reinforce the relationship between the WTO and the academic community. Essays must be submitted by 1 June 2018, must address issues related to trade policy and international trade co-operation and cannot exceed 15,000 words. 2018 World Travel Awards: Nominees have been selected and voting for African winners in is open up to 19 August in categories including (*Kenyan nominees in brackets) – Leading Luxury Private Villa (Cottar’s Bush Villa, Maasai Mara) Africa’s Leading Tented Safari Camp(Elephant Pepper Camp Masai Mara, Fairmont Mara Safari Club, Finch Hattons, Mahali Mzuri, Porini Amboseli Camp, Selenkay Conservancy) Africa’s Leading Safari Lodge (Borana Lodge, Kicheche Bush Camp, Loisaba, Ngerende Island Lodge, ol Donyo Lodge, Sirikoi), Africa’s Leading Meetings & Conference Centre 2018 (The Kenyatta International Conference Centre), Africa’s Leading Serviced Apartments (Cowrie Shell Beach Apartments), Africa’s Leading Private Island Resort (Manda Bay, Rusinga Island Lodge) Africa’s Leading Luxury Hotel Villa (The Cliff Villa, Alfajiri Villas) Africa’s Leading Hotel Residences (Palacina), Africa’s Leading Hotel (Fairmont Mount Kenya Safari Club, Fairmont The Norfolk Hotel), Africa’s Leading Green Hotel ( Nairobi Serena Hotel, The Aberdare Country Club) Africa’s Leading Family Resort (Fairmont Mount Kenya Safari Club, Leopard Beach Resort & Spa), Africa’s Leading Business Hotel 2018 (Fairmont The Norfolk Hotel, Radisson Blu Hotel, Nairobi Upperhill, Tribe Hotel), Africa’s Leading Boutique Hotel (Giraffe Manor, The Safari Collection, Hemingways Nairobi, Lion in the Sun) Africa’s Leading Beach Resort (AfroChic Diani Beach, Almanara Luxury Resort, Swahili Beach, The Majlis), Africa’s Leading All-Inclusive Resort 2018 (Diamonds Dream of Africa) Africa’s Leading Tourist Board 2018 (Kenya Tourism Board) and Africa’s Leading National Park (Masai Mara National Reserve). Kenya Airways has been nominated for Africa’s Leading Airline – Business Class, Africa’s Leading Airline – Economy Class, Africa’s Leading Airline, Africa’s Leading Airline Brand 2018 and Leading Inflight Magazine (Msafiri). Also nominated are Fly540 and Jambojet, for Africa’s Leading Low-Cost Airline 2018 and AirKenya, Fly540, Mombasa Air Safari, Safarilink Aviation, Tropic Air for Kenya’s Leading Domestic Safari Carrier 2018. What other opportunities are there for readers to apply for? This entry was posted in African Union, Agriculture, Donor AID, entrepreneurship, ideaexchange, Kenya Airways, Kenya ICT, Masai Mara, Microsoft, scholarships, SME solutions, Tony Elumelu Foundation, UNCTAD, Visa on April 17, 2018 by bankelele. 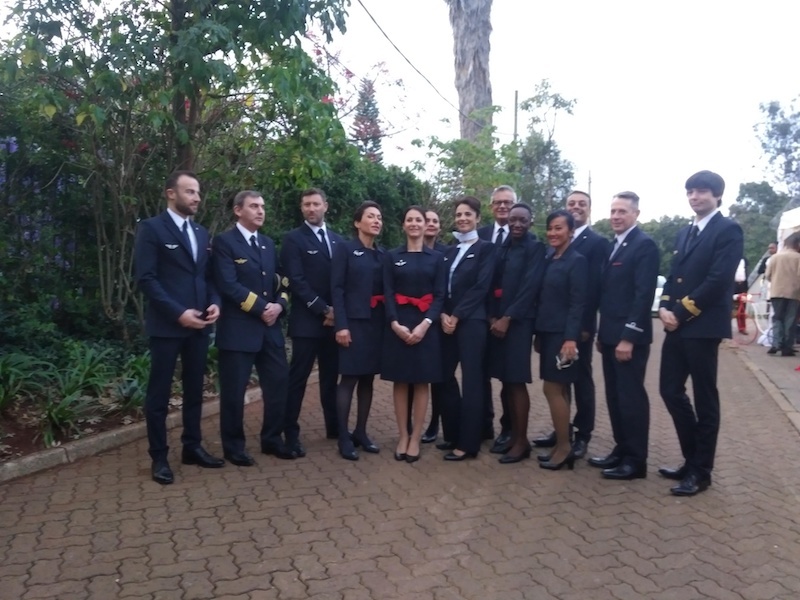 Air France has resumed flights to Nairobi and will join an expanded joint-venture partnership between KLM and Kenya Airways that was established in 1995. The inaugural flight using a Boeing 787-900 landed on March 26, which was eighteen years to the day when Air France had ended its Nairobi flights. The new flights will be three times a week using a Boing 787 and AF814 will leave Paris-Charles de Gaulle at 20:50 on Wednesdays, Saturdays, and Sundays, arriving in Nairobi at 6:00, the next day and AF815 will leave Nairobi at 08:20 on Mondays, Thursdays, and Sundays and arrive at Paris-Charles de Gaulle at 15:50. From this summer, the Air France-KLM group comprising Air France, KLM, Transavia, and Joon will serve 51 African destinations on 489 weekly flights as in April 2018, Joon will begin serving Cape Town (South Africa) from Paris-Charles de Gaulle. This entry was posted in France, Kenya Airways, KLM on March 27, 2018 by bankelele.